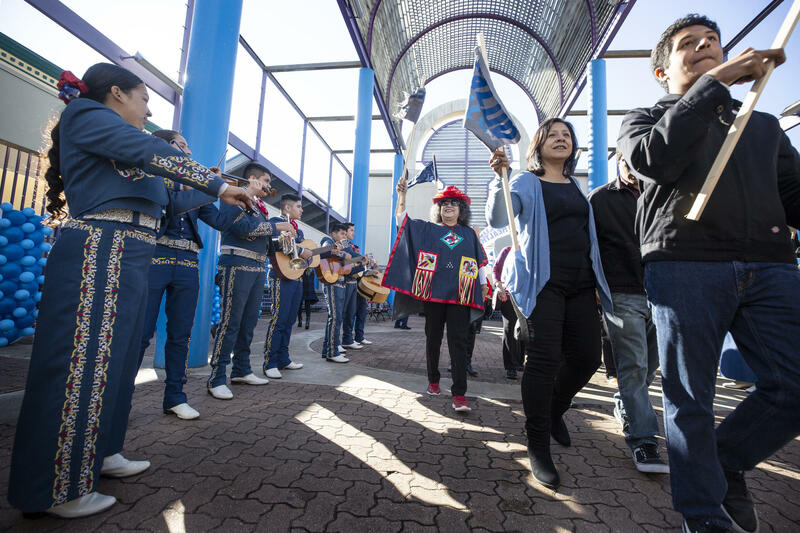 The 44-year-old told a crowd of about 2,000 people gathered at Plaza Guadalupe in San Antonio about his life there – from going to school to becoming mayor. He thanked everyone who had helped him get from then to now. But, he said, there's more work to do; the country is falling backward instead of moving forward. "I want to make sure the promise of America is available for everyone," he said. 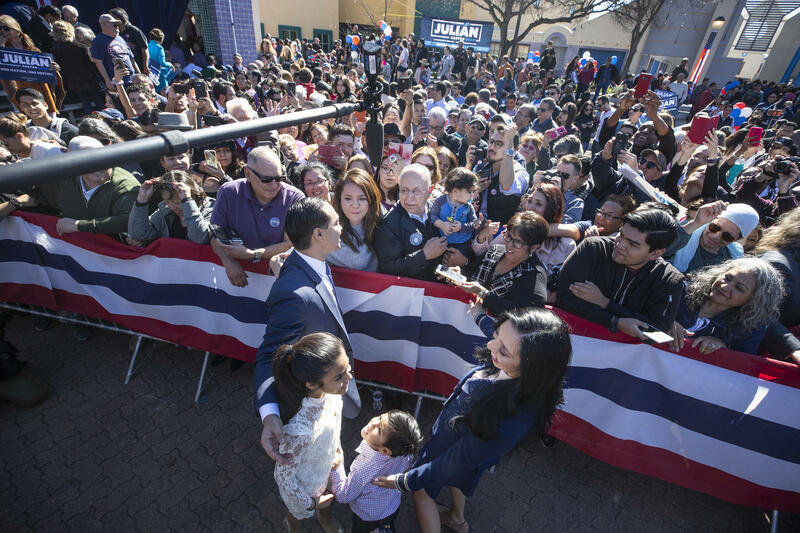 He then announced – in both English and Spanish – that he was running for president. A mariachi band welcomes supporters to the Castro rally. He ran down a list of his campaign priorities, starting with education. While San Antonio mayor, Castro had pushed for a sales tax increase to fund full-day pre-kindergarten. “Here in San Antonio I made pre-K for SA happen. As president, I’ll make pre-K for the USA happen," he said. On health care, he focused on lowering costs and joined many other Democrats in calling for a Medicare-for-all insurance program. Sophia Guerrero watches Castro's speech from the front row. He got perhaps the biggest applause of the day when talking about criminal justice reform. He pointed to the need to change law enforcement culture in America and brought up the deadly shooting at Emanuel AME church in Charleston, S.C.
Castro also pulled from his time as HUD secretary, saying there's a housing affordability crisis in the country. Castro supporters hold up buttons before the event. One expected moment in announcement speeches and subsequent campaign stumps is an idea of the first thing a candidate would do as president. Castro told the crowd he would sign an executive order recommitting the U.S. to the Paris climate accord. “We can fight climate change and create great jobs here in America," he said. Castro's announcement came after the usual pre-announcement speeches, which focused on the problems a Castro presidency would be able to fix. He was immediately preceded on stage by his twin brother, U.S. Congressman Joaquin Castro, and his wife, Rosie, and children, Cristián and Carina. 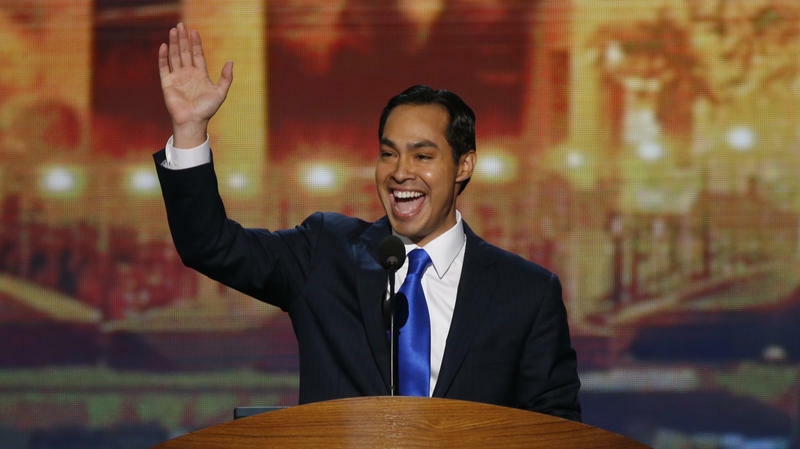 Castro is the first Hispanic candidate to enter the race for the Democratic nomination. He joins Massachusetts Sen. Elizabeth Warren and Hawaii Rep. Tulsi Gabbard. Another Texan, Beto O'Rourke, is also weighing a presidential bid. Castro's first trip as an official candidate will be to Puerto Rico on Monday, where he’ll visit hurricane recovery sites and speak at the Latino Victory Fund Political Summit. He then heads to New Hampshire. Castro's wife, Erica Lira, and children, Carina and Cristian, join him on stage after his announcement. Castro entered the political spotlight when he was elected San Antonio mayor in 2009. He served until 2014, when he left to become the U.S. secretary of Housing and Urban Development under President Obama. He stayed on until 2017. The Castro brothers have long been tied to Democratic hopes for wresting Texas from its two-decade-long Republican control. Both have been rumored to be running for multiple offices, including governor, U.S. senator and president (can confirm that last one is true – see above). Castro graduated from Thomas Jefferson High School in San Antonio and received his undergraduate degree from Stanford University. He then got his law degree from Harvard. Julián Castro is taking another step toward a 2020 presidential campaign. 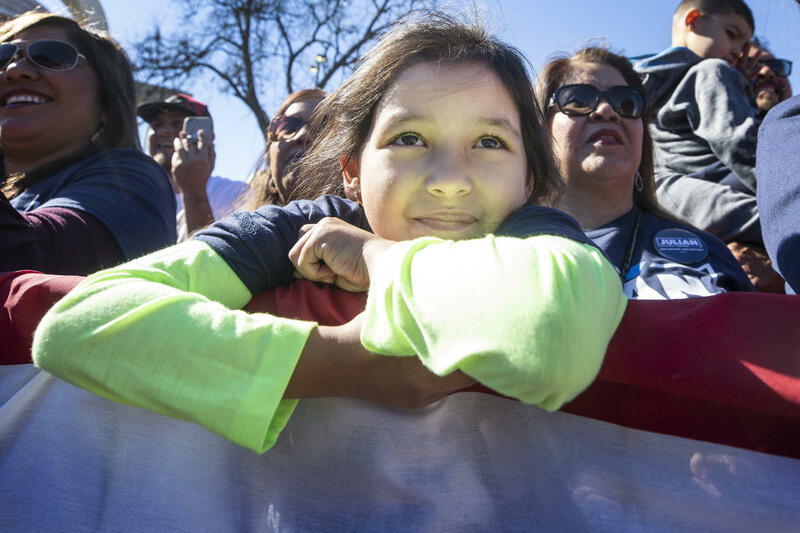 The former U.S. housing secretary and San Antonio mayor announced Wednesday that he has formed an exploratory committee to consider a bid and will make an announcement Jan. 12 in Texas. 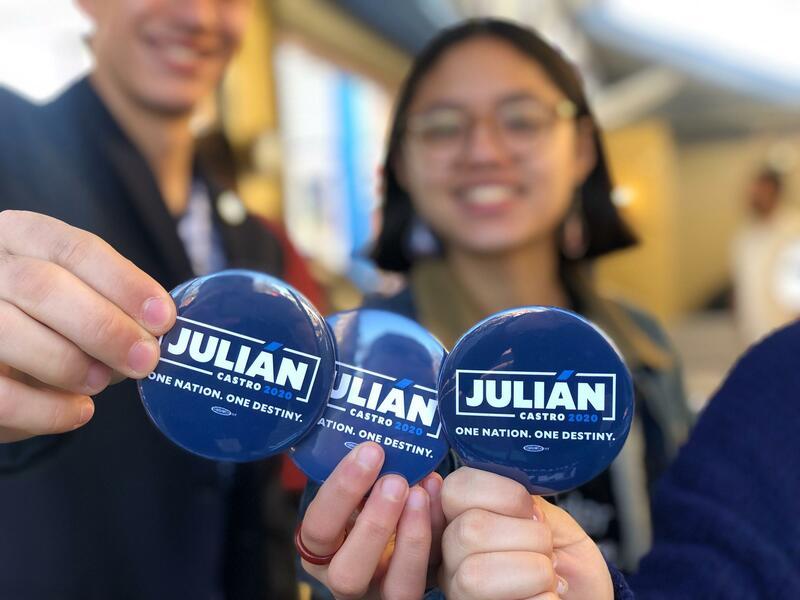 The committee is called Julián for the Future. From Texas Standard: In 2012, the mayor of San Antonio, Julián Castro, won a spot at the Democratic National Convention. He gave a keynote address that would propel him into the national spotlight – in a similar way that Sen. Barack Obama's speech had some eight years before. Castro's rising profile was reaffirmed when President Obama tapped him to head the U.S. Department of Housing and Urban Development in 2014.